Image Description: A banner-image of a sword, presented in a diagonal fashion, with the hilt of the blade in the lower-left corner and the tip of the blade in the upper-right corner. 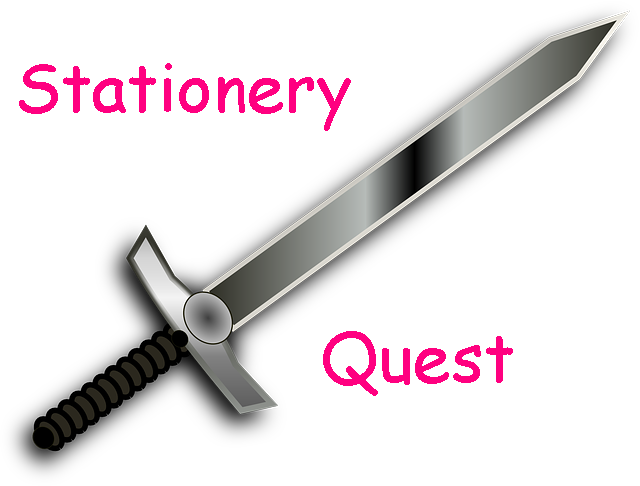 In the upper-left corner is pink text reading “Stationery” and in the lower-right corner is pink text reading “Quest”. When I went to the Miniso store in Highpoint, I have to say I was rather underwhelmed, I was expecting more then what was on offer. So, I decided I would venture forth to other Miniso stores available to see if they stocked more Stationery Items or perhaps interesting Stim Toys. Image Description: a large white structure with lots of transparent glass. There’s a large white beam that dominates the image, on top of the white-beam is a neon-sign in yellow that says “THE DISTRICT”. Underneath the white-beam is the text “DOCKLANDS” in black. Image Description: a wide photo of a mostly white storefront (the interior is also white). 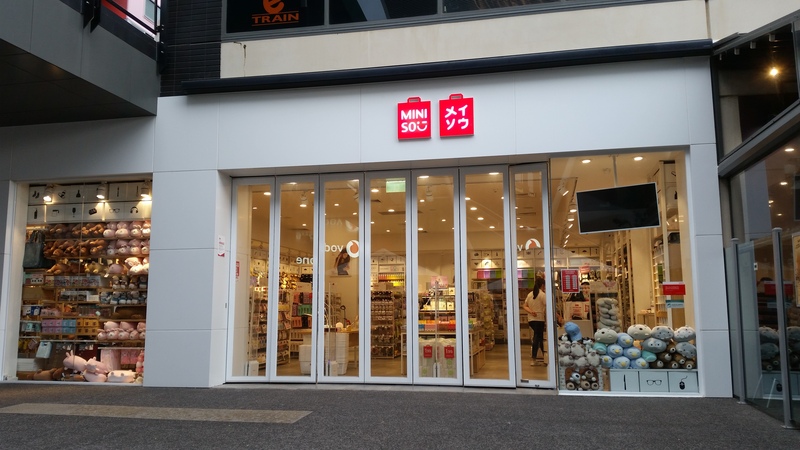 Above the glass door display is the company logo, which is a red-gift-bag with the text “Miniso :)”. Next to this logo is another sign in the shape of a red-gift-bag with Japanese katakana symbols on it. Image Description: a wide-shot of shelves, the shelves are divided up into six segments, and in each segment is a different variety of plush-toy-cushion. There’s polar bears, ducks/chickens, blue penguins, dolphins, grey owls (? ), pandas, brown bears. Image Description: a close-up picture of three wooden rows of shelving. 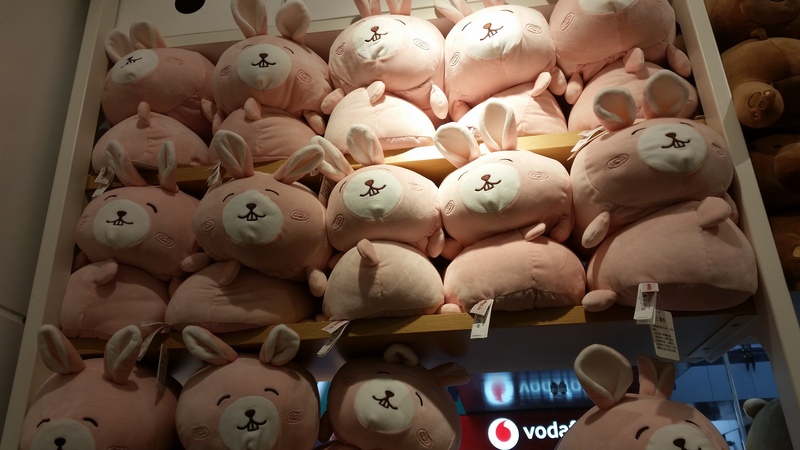 On the rows of shelving are large plushy cushions that resemble pink bunny-rabbits with closed eyes and smiling. 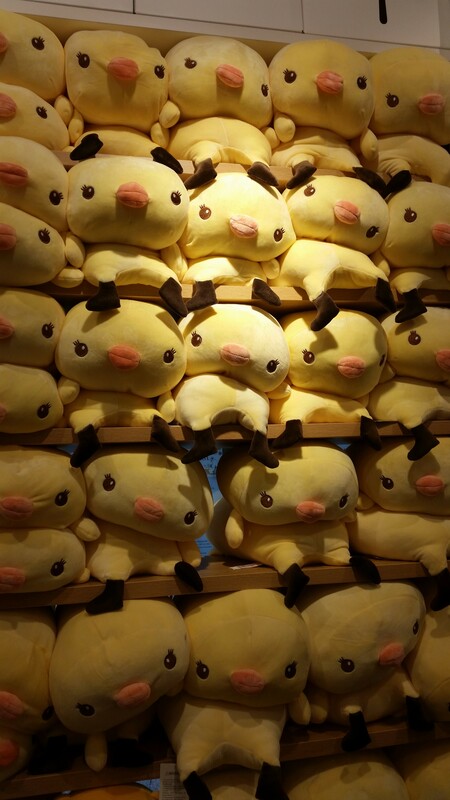 And, just like Highpoint, Miniso Docklands also has it’s own Wall of Ducks! Image Description: a close-up picture of six wooden rows of shelving. 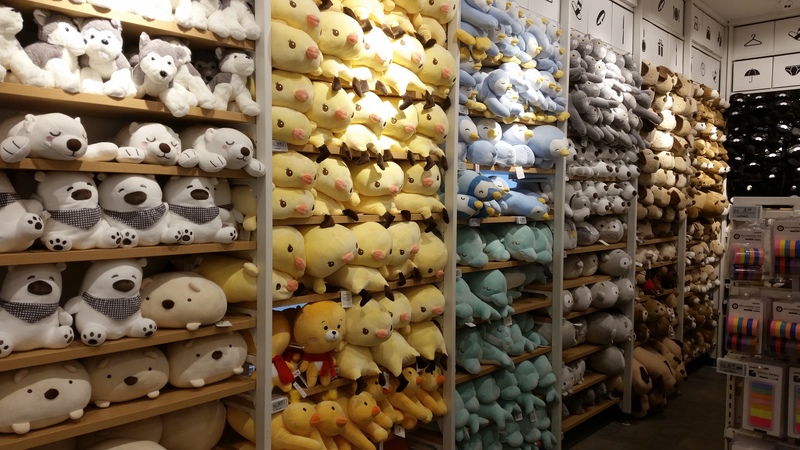 On the rows of shelving are large plushy cushions that resemble ducks and/or chickens. Image Description: a close-up picture of six wooden rows of shelving. 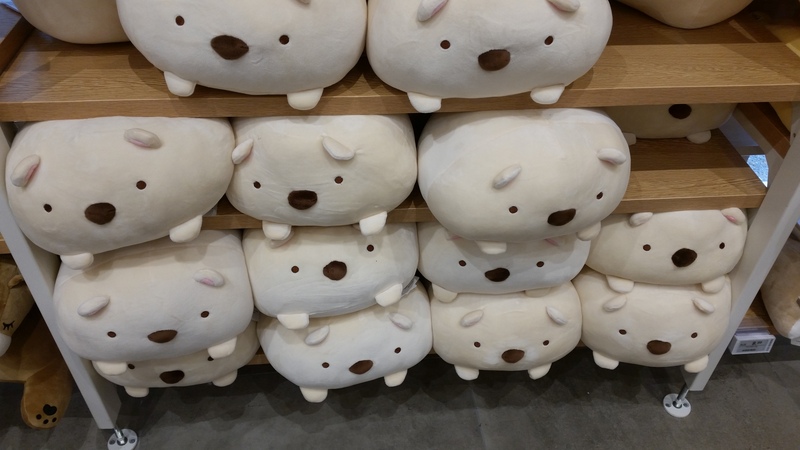 On the rows of shelving are large plushy cushions that supposedly resemble polar bears. The label says “Bear”, however, I refuse to believe it. Those plushies do not look like bears to me. I know that these are just fuzzy cushions that vaguely resemble animals, however, the design makes me irrationally annoyed. They don’t even have mouths! Why would you leave that part out of the design process? They included tiny nubby-hands but no mouths? IDK. 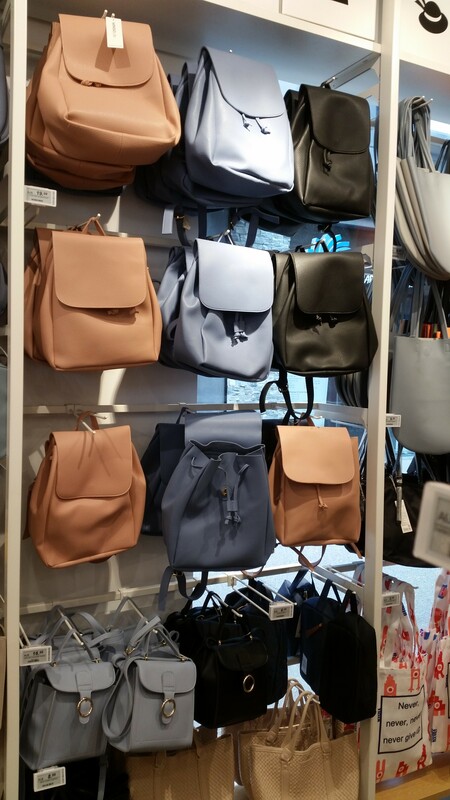 Image Description: a hanging shelf-display of faux-leather handbags that look like small back-packs. They are manufactured in three colours: coral pink, robin’s egg blue, and black. ~Small Bags of Holding: Miniso does have a small selection of nice handbags, I bought a black one for an upcoming interview. 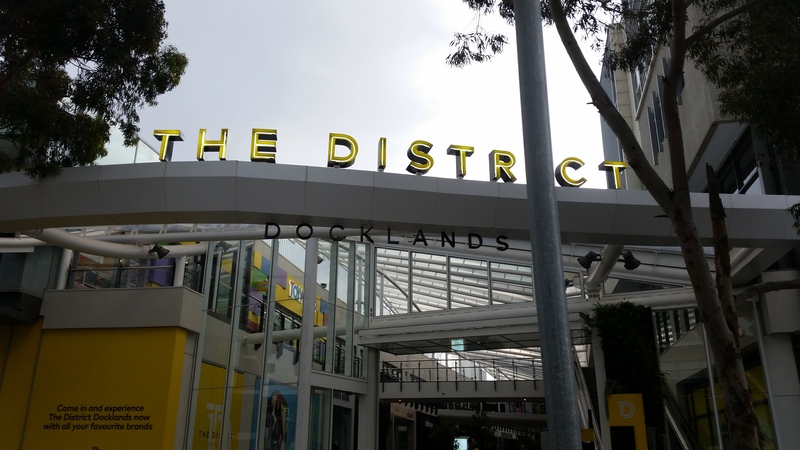 ~Size Does Matter: The Docklands store is smaller than the Highpoints store. I kind of get the feeling that the store has only just recently opened and they’re still sorting out where to put stuff. So, once again, I am a giant in a tiny store, trying not to knock things off the shelves Godzilla-style. Image Description: a large display-counter showcasing various types of cosmetics. The Cosmetics items are things such as perfume, lipstick, foundation, facial cleansing wipes and make-up bags. 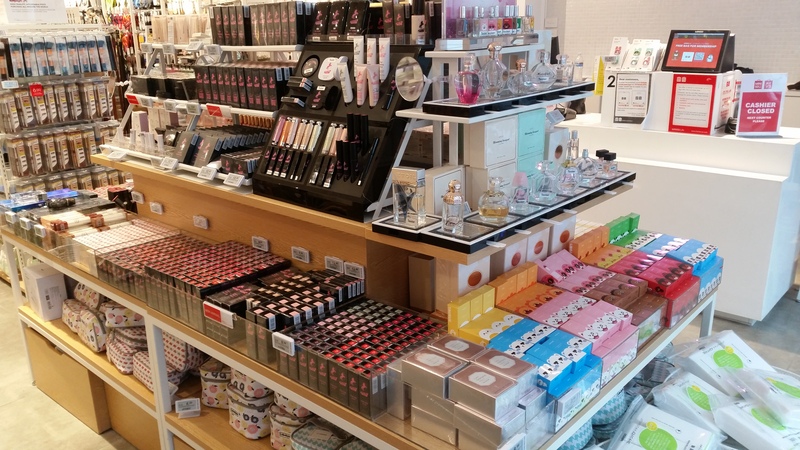 ~A Wide variety of cosmetics: A large section of the store is dedicated to cosmetic items, so if you’re interested in getting cheap make-up, there’s a lot of stuff to choose from. It’s not so much a bad thing, I’m sure some of the items could be used for Stimming purposes, it’s more a “This is not what I came for” type of thing. Image Description: the image is a hanging shelf display of stationery items. The first two rows are a collection of 12-packs of coloured adhesive-tape. The rest of the display is comprised of two variations of rainbow-themed sticky-tabs. ~Smaller Stationery Section: The whole point of going to this store was to see if their stationery range was bigger, but it was the exact opposite, it was even smaller than the selection available at Highpoint. 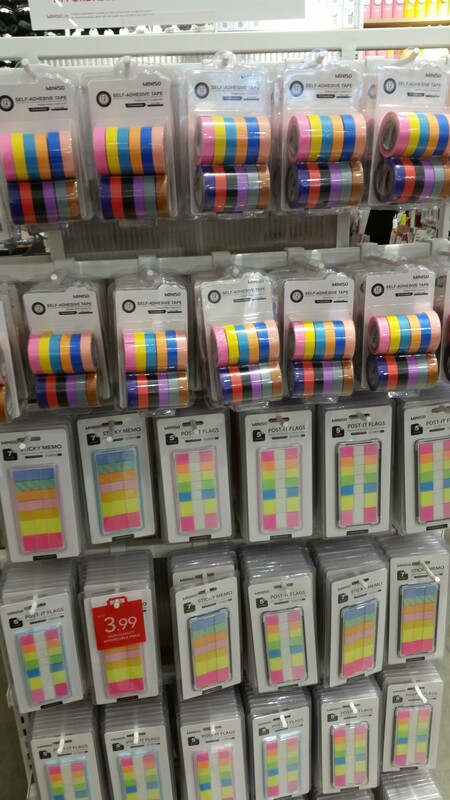 It does have a collection of tape and sticky-tabs, however, there were very little stationery items available. It had the same small nook of pens as the Highpoint store but it’s not a great variety. All in all, if it weren’t for the large collection of plush items, I would consider this quest almost a failure. Ah well, however, there’s another Miniso store at DFO Southbank, so that’ll probably be the last store I check out.